A number of years ago I bought a book where the artist painted the picture in acrylics and then went over her picture with a few accent lines in oil pastels – I loved how it looked both because of her happy colors and the looseness of the added lines. The book was “Paint Happy” by Christina Acosta. I think the book is out of print, but you can get used copies at Amazon. I have been thinking about this technique and also similar techniques of other artists. I noticed on a number of my Lang calendars, the artist will embellish their water color or acrylic paintings with colored pencils – sometimes the embellishments are very subtle and other times the line work is very free with exaggerated lines and loops. My friend Amy Mogish who works in acrylics and pencils will sometimes basecoat her designs before doing the pencil work on them. Erica Joanne also basecoats in acrylics and then does the pencil work on her designs. She did this on her latest project in the Decorative Painter. I love how their designs look mixing the acrylics and pencils. You can see more of both of their work on their respective web sites: Classic Amy Joanne and Erika Joanne. 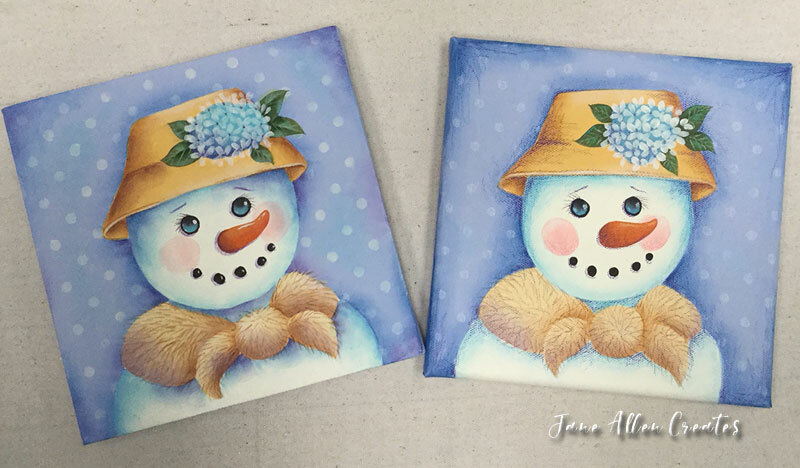 When I did the Snow Lady last week I thought it would be fun to see how it would look using acrylics and pencils. So I thought I would start with the same base coating and some of the floating on the different objects. Here is the original post – Snowlady. You will find the pattern and all the painting details on that post. Again I used an 8″ x 8″ canvas and DecoArt paints. I started by base coating the background Soft Lilac, snowlady – Warm White, hat – Moon Yellow, shawl – Buttermilk. I then painted the leaves – Hauser Medium Green, the flower – Indian Turquoise, the eyes and mouth – Soft Black and the nose – Spice Pumpkin. I then used a wash of Spice Pink for the cheeks, shaded the face and body with Indian Turquoise and the background with Sapphire. The shawl and hat were shaded with Honey Brown. Warm White highlights were floated on the shawl and Buttermilk highlights on the hat. A wash of Grape Juice was floated on the shawl. I also floated the bottom of the eye with Indian Turquoise. I then added the dots using Tracy Moreau’s Stencil – Polka dot Background (www.tracymoreau.com) and my White (PC938) Prismacolor pencil. I like how the dots look using the pencil. You can use any color of pencils you would like. I tried to pick colors that were similar to the colors I used to paint, although I did not have perfect matches for all of the colors. I then started using my pencils on the shading. I have to admit, I had trouble stopping to take the picture. It was so easy to get into it and I was loving how things were starting to look. I love how the texture of the canvas was brought out with the pencils. I started penciling by going over the Indian Turquoise areas on the face and body with Deco Blue. I also added a little to the background and strengthened with Non-Photo Blue. I used Blue Violet Lake on the background shading and on the purple areas on the shawl. Also added Eggshell on the highlight areas on the shawl. Go over shading on hat and line brim with Sienna Brown. Shade flower with Parma Violet and strengthen with Violet. Shade leaves and create vein shadow with Olive Green. I painted the petals on the flower with DecoArt Warm White acrylics. Line fur on collar with Sienna Brown. Add eyelashes with Black and highlights in eyes with White. Deepening shading on background, face and body with Violet. Also draw eyebrows and line on left side and under eyes, nose and mouth and shade back of nose with Violet. Highlight over Apple Green on leaves with Non-Photo Blue. Paint center of petals with Parma Violet. Draw veins in leaves with Grey Green Light. Shade bottom of cheeks with Pink and draw White highlight. Highlight top of nose with Yellow Orange then White. Go over shawl by drawing more hair lines with Yellow Orange and Parma Violet. Shade center of some of the petals with Non-Photo Blue. And Wa La, we are done. The acrylic/pencil project is on the left and the painted project is on the right below. I enjoyed how easy it was to add the highlights and shading with the pencils. It was very relaxing and went quickly. Doing this project also has given me some other ideas on how to mix pencils with water colors, but I will save that for a future project. I hope you enjoyed seeing how to do the same project two different ways. I hope you will give it a try. Thank you Charlotte it was fun, you probably already do similar things with your mixed media. Thanks Effie, it was really fun. Sometimes I have to do things over because I forget to stop and take photos. Thank you so much. Looks like a lot of fun. I can’t wait to give it a go. Thanks Dani, I hope that you enjoy it. Love it Jane! ….and that you experiment! …..and the pencils are moving🙂🙂🙂! Fun post! Thanks for the mention! Thanks Amy it was very fun, and gave me ideas for other things. Thank you Pat, I really enjoyed doing it. Nicely done…I would like to try this!! !